From Bandai, Plex Co., Ltd. & X Plus Co., Ltd. Godzilla's arch enemy Anguirus from the film Destroy All Monsters (1968) recreated as a 12-inch figure. A PX Previews Exclusive figure! Godzilla's spiny nemesis lives again! Once one of Godzilla's most fearsome foes, the monster Anguirus became the mighty Godzilla's trusted ally. 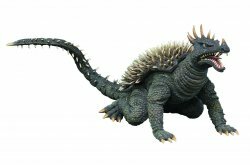 This new figure sculpts Anguirus based on his appearance in 1968's Destroy All Monsters and measures 12" long. Destroy All Monsters (known in Japan as Attack of the Marching Monsters) was the ninth in the now historic film series. Since it was intended to be the final Godzilla film at the time, it was produced with a higher than normal budget. Each hand-painted vinyl figure is expertly crafted to capture every detail of these classic movie monsters! Important Shipping Note: You must choose your desired shipping service at the drop-down menu above and in the shopping cart. If you choose Priority Mail 2-3 day shipping, a DIM Weight surcharge as required by USPS for large boxes is added to the total. Collectors Note: Factory sealed in X-Plus Garage Toy brown cardboard box. Photos show loose figure to show detail. MyMovieMonsters.com also offers other X-Plus figures as well as Medicom, Marusan, M1GO, Bear Model, Sofubi Life, Marmit, Bandai and Tamashii Nations S.H. MonsterArts figures.